Our Lower School focuses on developing the "whole child." We consider the needs of every student, allowing the child to develop cognitively, emotionally, socially and spiritually at their own rate. A child's learning style, pattern, and progress are as individual and unique as he or she is. That's why we believe that each child's education should be personal and customized. Children with access to different and unrestricted learning experiences are given the gift of individuality and time. 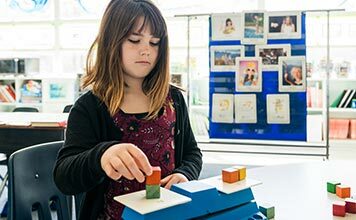 Our Lower School encourages experimental learning which supports students in applying their knowledge and conceptual understanding to real-world situations. Whether it's working in our gardens, learning about sustainability at local farms, planting seagrass in our community or chasing weather balloons - our students learn best by doing.